This is my view for a good part of the day. It is a favorite space for me as I spend a lot of time in this area. It is my work space. bring every single one of them home. Being that Spring has newly arrived and I have Spring fever, I have added into to the mix a couple of small planters. This little monkey came from WM. 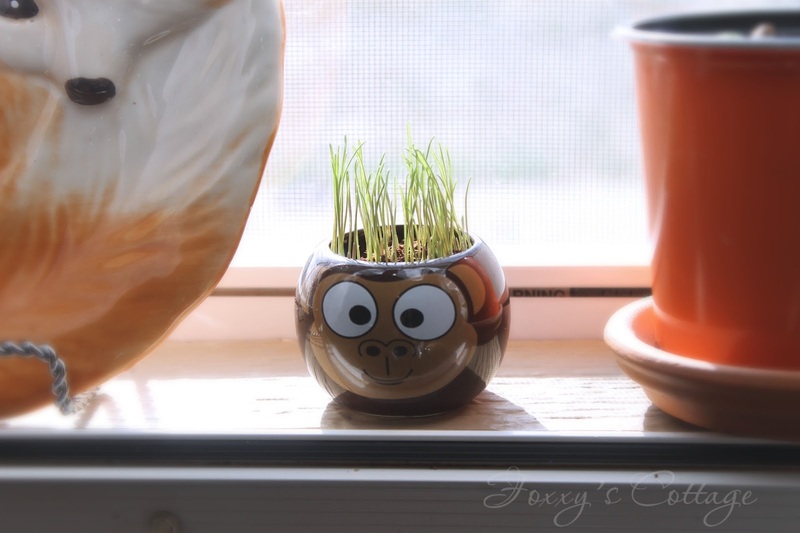 He came with grass seed that grows like hair. Although he is not a fox I think he feels right at home nestled in among the other little critters. His hair grows fast. I think he'll be due a hair cut soon. I didn't plant this one. I picked up this plant at our local supermarket a few months back for almost nothing. It was fall themed and was on clearance so home it came with me. It had a scruffy scarecrow attached to it but that part ended up in the trash. I only kept the little basket with the plant. I hate to pass these up when they're marked down. I always think if they don't sell they'll end up in the trash. So I like to think I rescued it. The fox plant stake came from WM as well. This one came from Family Dollar and it's sunflowers. These popped up really quick. I think it took only three days for them to break through. I'll need to seperate these soon but they'll go in my back yard later. We had a special birthday over the weekend. Our son Michael turned nineteen. He is very special to us. He is our middle child and our only son. Being the only boy he gets a lot of love from his sisters. He is a freshman at college studying Electronic Engineering so he is quite smart too. We celebrated by taking the family out to eat. 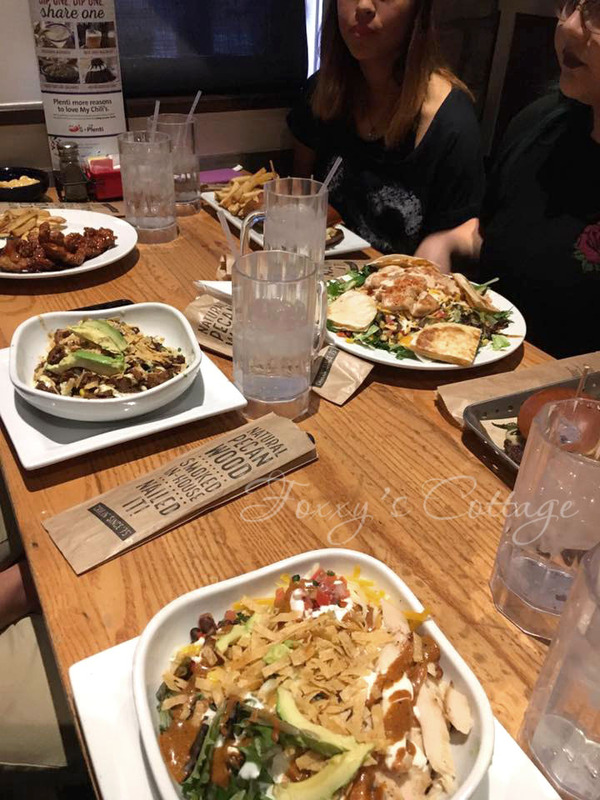 It seems to be a birthday tradition in our family to go out to eat. I cook a lot and family meals are usually at home so going out is always a treat. 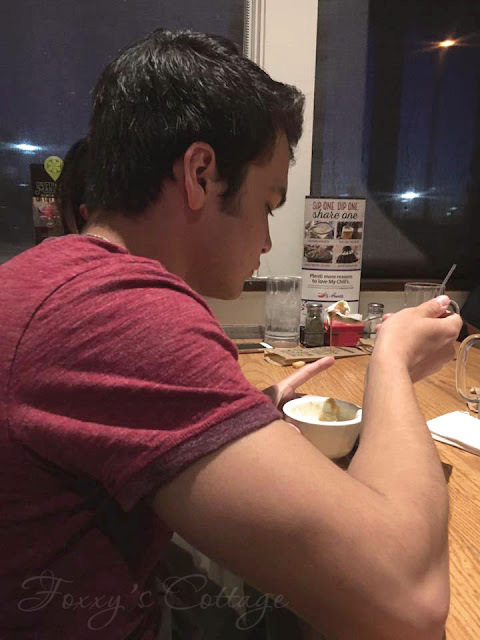 Here he is enjoying his birthday ice cream. It's hard to believe this is his last year as a teenager. It seems like he was only a little boy just the other day. I wish time would do me a favor and slow down a little bit. Loving the fox theme windowsill!! Yes, time flies by in a blink. Your window looks so cheerful . . . we spend so much time at the kitchen sink that it's nice to make it pretty and be a happy place for us as we do our daily chores. 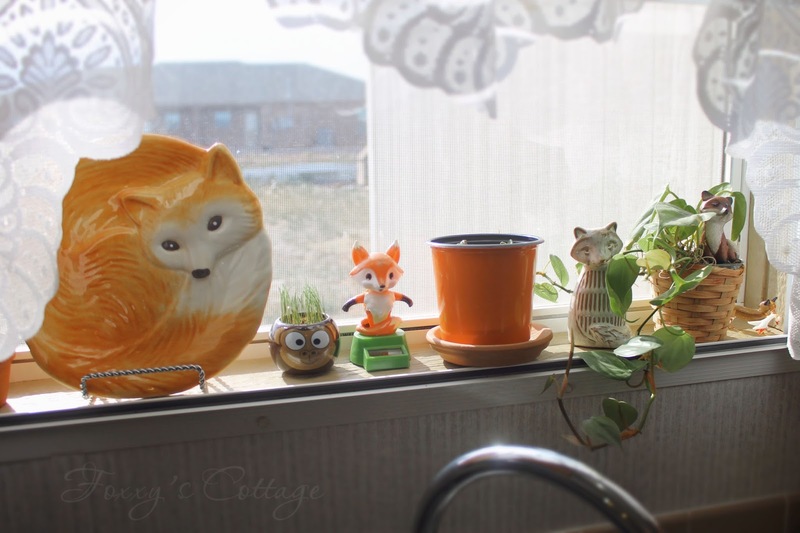 I can not imagine not having a window over my sink. I'm one of those rare people who enjoy washing dishes and having a view and flowers or plants in the window add to the enjoyment. 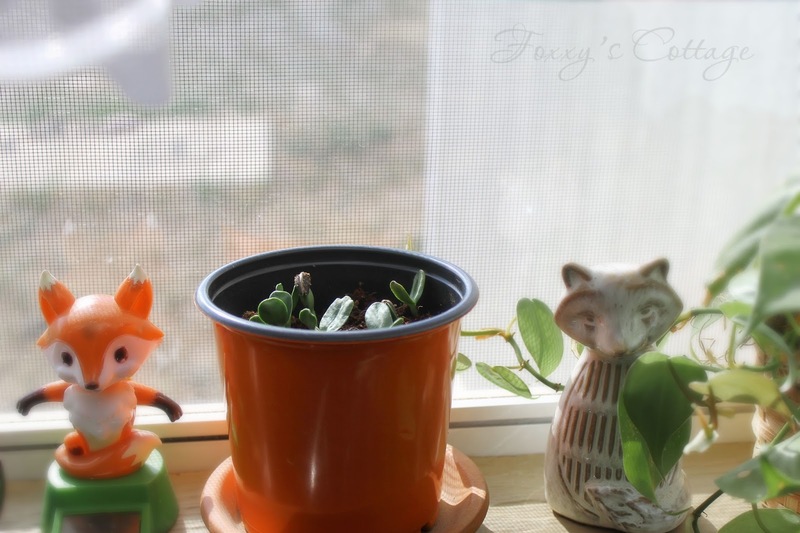 I especially like the little fox that is sitting in the plant . . . you have a sweet collection. 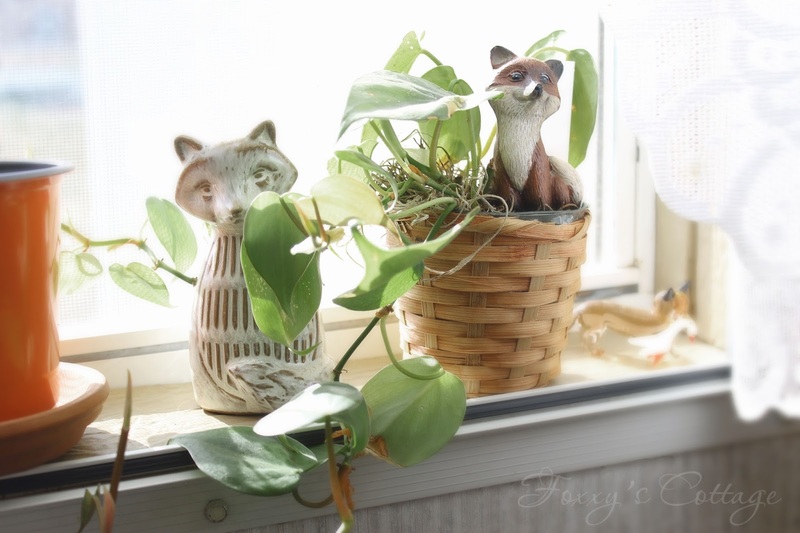 Your collection on the windowsill is very pretty and makes for an even more lovely view out the window. Happy birthday to your boy. Mine were both born in October and this year will be turning 22 and 19, respectively. Very hard for me to believe especially since they are both so very far away in college. :( Even far away from each other (CO and NY) Happy Friday! The scarecrow is so cute..